I've compiled and posted a bom to google sheets. It contains part numbers @ Mouser. For creating a mouser cart just filter out the blanks in column PART NUMBER MOUSER, copy paste the QTY and Part number columns, usually these two are enough. *The super long pin headers, are the ones I added correct? *Switches, these are the ones Snercle recommended but if someone could find a mouser or just about any other store equivalent that would be amazing. *Cells without part number - should only be the ones labelled 0r - which indicates a piece of wire / jumper / or a 0 ohm resistor. I just use the offcut resistor leads. * Small caps <22n - I would go with the cheapest ceramic you can find for most of these, as that's what I used while designing and on all subsequent builds. Values higher than that are mostly polystyrene though. * Film caps - Yes those Epcos/TDK B32529 series PET look fine. *Spacers - Another one I missed off the BOM is that you need one extra 12mm spacer like this R30-1611200 for the "stop adj" bolt to sit on. Also the bolt itself - which should be a 20mm m3 metal bolt - and a metal m3 nut. Huge props for compiling this, and getting this thread started. Shall we make this the official BOM? Not sure if everyone is seeing this yet so I'll mail out updated docs in a bit . . Thanks for doing this Ordering as soon as everything is checked! would you mind linking to your mouser project/cart after you order it? I found using Song Huei trimmers I had to relocate an extra two resistors to the back side of the board. On the subject of the resistors, thanks for bringing that to attention! I managed to fit carbon resistors, but this is probably an area for builders to watch out for before soldering components in. OP, builders: some videos jamming with the thing would be appreciated! @aabbcc did you do a complete BOM on mouser? Otherwise I can share mine. There were a few components of those you listed not available. I'll need to check again, but I believe I measured it running at somewhere between 180 and 220 mA per side. If you're providing a nice regulated +/-12v I believe you can leave the PSU section unpopulated and wire the power straight up to the "test" pads (shown in the calibration guide). I'll check this to make sure and get back to you though. any ballparks on the cost of the bom/enclosure? Lol, when I was checking out my 50x 100k pots it told me they were out of stock anyhow, got them at musikding for 0.6 eur each so no worries. *3x 18k resistors, either missing from bag or bom is incorrect. *My axial elcos for the expander boards from Reichelt (Vishay) were horribly out of spec, will the below listed still work or should I get some other ones? *In step 45: 100k trim above "RM" - is this supposed to go on the underside of the board? Seems really cumbersome to trim otherwise. *What are J6 and J7 (headers? Marked in red on photo) used for? *There are 2x 10uf caps with 5mm pin spacing and an oval silkscreen (As opposed to circle) 1 on the pot board and 1 on the engine board. Why is the silkscreen oval for these two? *Im missing 1x 220n cap, might have been missing 1x from the bag or the bom needs correcting. *BONUS QUESTION 2: is there a proper way to make the mains voltage area less dangerous. 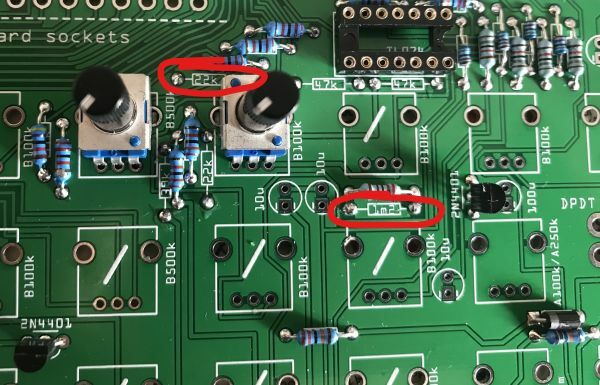 Would covering the soldering points around that area with kapton tape work? Thanks aabbcc, build is looking great! * 2x 10n are 2.5mm : agh I thought I had spotted all of those - I think the 10n caps I used had a sort of "inbetween" lead spacing, I can see it probably isn't easy to get other sots to fit there - need to fix that. * I think those off spec axial caps should be fine - they won't be doing anything more than power filtering and dictating decay times, but you'll find that you usually have a trimmer or pot to control decay, so it shouldn't affect things too much. 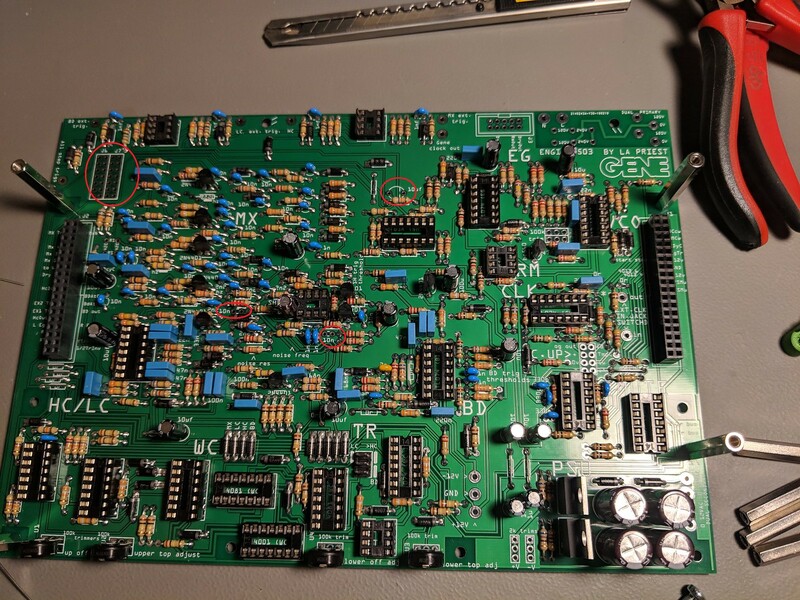 * This is the RM vco shape trimmer - it should really be mounted on the underside yes, and adjusted from the front to avoid contact with the AC stuff at the back of the pcb. The sound seems to work best with the trimmer around the middle position, the effect on the RM character is subtle. * the headers J6 and J7 are really just a bit of space for prototyping or modifications - they aren't connected to anything. Also don't know if I mentioned before the header marked "C . UP >" is for future clock upgrades. If you want to, you can add the header to the underside of the board as you go along. It provides connections to all the important parts of the clock and it's controls as well as power, so in future an add-on board could slot right in there and add some extra clock functions. * will check the bom for that 220n cap! * bonus question 1 : haha, we'll never know ..
* bonus question 2 : yes (i think ideally this would be on a separate board or something) for safety, putting insulating tape over both sides of that part of the board would be a good idea - especially while testing / calibrating. Can't be overstated how important this kind of feedback is really. I wonder what made you incorporate mains voltage into this build. Was it to avoid wall warts? I’m just curious, because I’m not comfortable with high voltage DIY, and I guess it may be a barrier for many. I hear you. It's true that you must be a lot more careful and the consequences of skipping the double-checks could be a lot more serious when working with mains voltages. With a metal case I prefer to have some sort of earth connection to the chassis. Also there are high gain circuits inside so the supply must be quiet, and it draws about 200mA per side of the dual supply. If you can meet those requirements with a wall wart supply then you can easily connect it up, the holes are there on the board for this. I also never intended this to be a DIY project originally, I gave in to demands for a DIY option only a couple of months ago, so I had to go back through every detail trying to see it from an outside perspective.